"This is beautiful Dad. I never realized that a river can be such noisy", shouted my daughter after showing her charming smile and while enjoying the beauty of nature. She was just sitting besides me, on one of the bigger rocks at the river shore. "But it is also very beautiful. I am really liking it." "This same river can also be very very powerful my child. Flowing water always is." I was trying to explain her. "And see, the water is also so clean and clear. I can see the rocks at the bottom." "Yes of course. Rivers flow from the mountains and starts 100% pure, till the human intervention pollutes it." "Human intervention, like what Dad?" "Like factory wastes, sand from deforested land in the hills, throwing garbage etc..."
It was difficult to talk for long, considering the noise that the gushing water was generating. So, we decided to be with ourselves and enjoy the feast of the nature. We sat on the rocks near the river for the entire day. The same river, the same water, the same noise of the water striking against the rocks, but the pleasure did not subside till the evening. Next day, as per schedule, we went to the lake. Wow !! It is always such a different experience. Boating, looking and feeding those beautiful ducks was a true delight for the kids. Me and my spouse were watching them from some distance and the kids were playing around with the ducks. 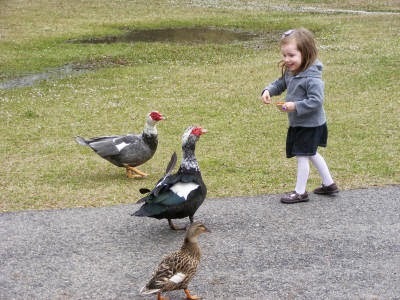 The younger one was very miser with the food she was offering to the ducks. Probably, she was concerned that her food might just get finished and then she wont be able to feed the ducks anymore. "Dad, the water is the same everywhere. But why does the water stinks here at some places, while the water in the river we saw yesterday was so neat and clean?" "Very interesting question dear. You are right that the water is the same. It is just that water in the lake remains the same for most part of the year till there is an intervention and refueling from the mother nature, like in the form of rain. On the other hand, the water in the river is continuously flowing, and therefore remains fresh and clean and pure always. It is the same with our life also. Does that answer your question dear?" "It did to a large extent dad, but what do you mean when you say it is the same with our lives." "See, many times, we try to hold on to what nature gives us - it could be money, love, may be your dress or your favorite toy or anything else. The more we hold on, it starts to stink after some time, just like the water in the lake. Possession is against nature." "If possession is against nature, then what should we do?" "Start giving. The more you give, the more HE will fill you up. Start using the money in its right way. Start giving love and appreciating people for the good work that they are doing. And when HE fills us back with love, it will be pure and fresh of course. We might initially feel that we would lose it if we give it away, while the fact is that when you give it away for the right cause, the void is filled back by HIM to establish the natural equilibrium." "You try and posses a pencil which your sister desperately wants. Yes, you will have it for sure. But remember, that after some time, the pencil will never look the same - it will deteriorate in looks and quality. Thats what nature is. But if you give away the same new pencil to your sister, first she will be so excited - that itself is a victory for you - bringing smile to someone else's face. And second, nature would make sure that your sister starts to think what she can do for you in return. She may not get you a new pencil in return, but she would do something that will fill up this vacuum that you created for the right reason." "Thats how it works in life. But you must trust Nature, give away a lot and let it work for us." "Thanks Dad, I understand that Giving should be a part of our life"
She hugs me, and then goes back to the ducks. As she starts to feed the ducks again, my wife points me towards her hand - It has more grains to feed than it ever had earlier. She just started to trust nature more than what she used to do, till yesterday. She just learnt to start giving more.